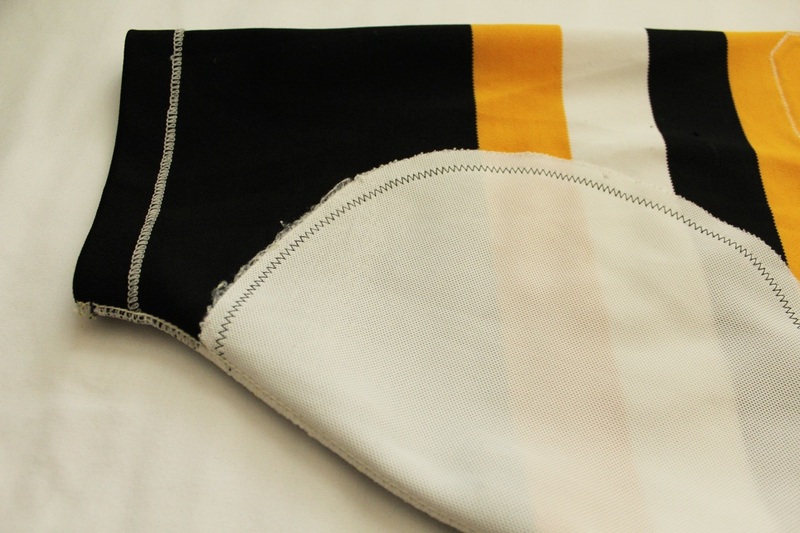 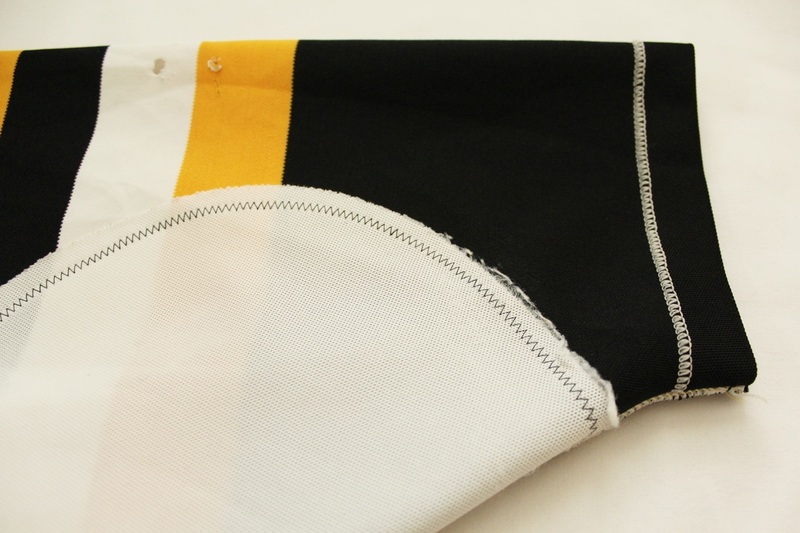 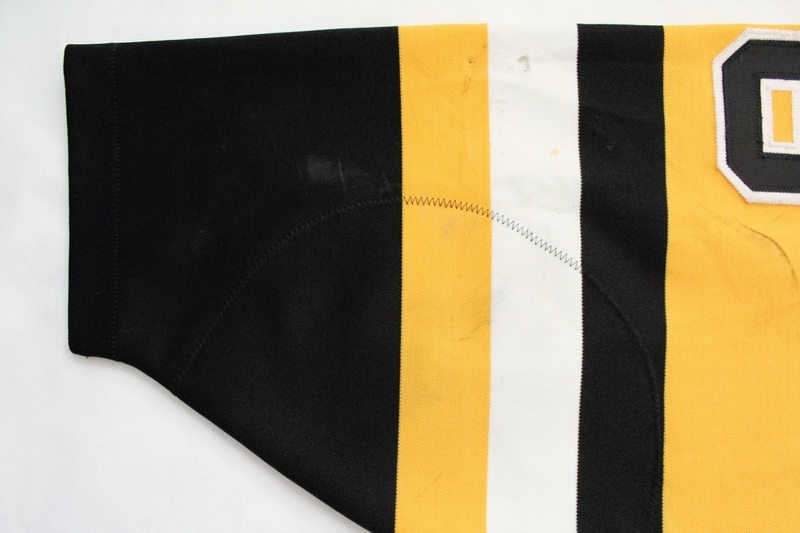 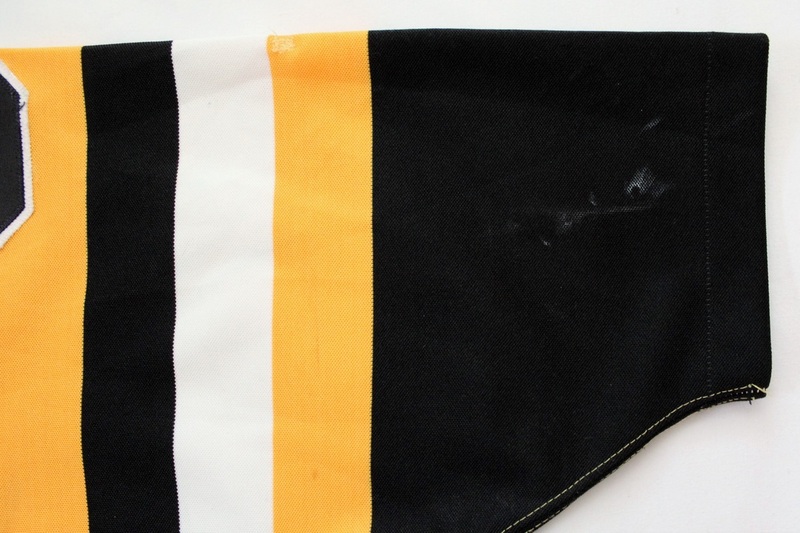 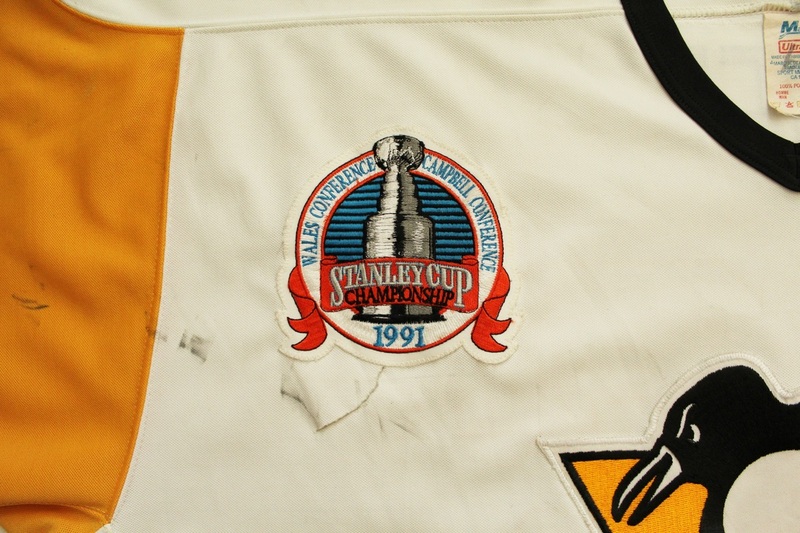 worn during the 1991 stanley cup final as lemieux's greatest goal in game 2 against minnesota changed the momentum of the series and an entire franchise. 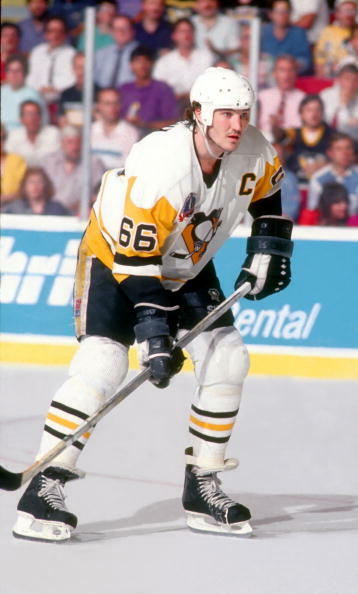 Mario Lemieux missed the first 50 games of the 1990-91 season recovering from off-season back surgery to repair a herniated disc. 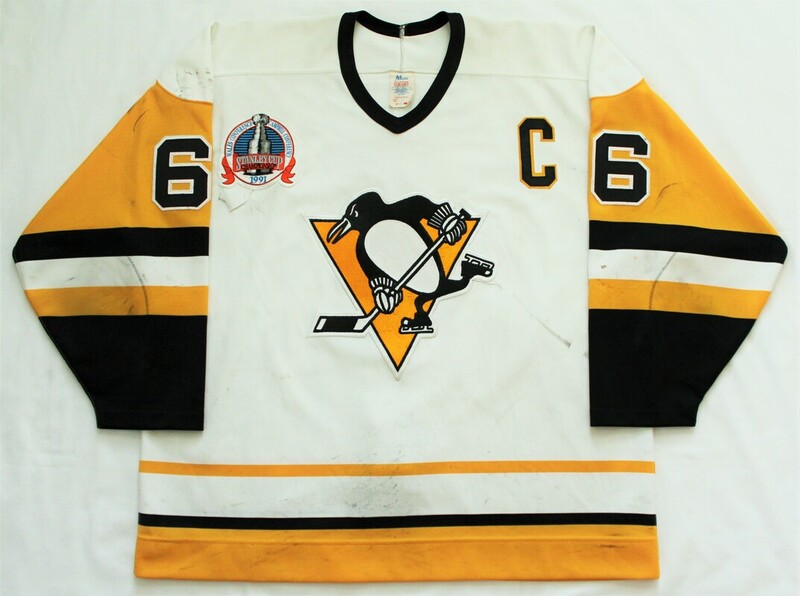 He was coming of a 1989-90 season in which he had a 46-game point scoring streak and was named the Most Valuable Player of the 1990 NHL All-Star Game in Pittsburgh. 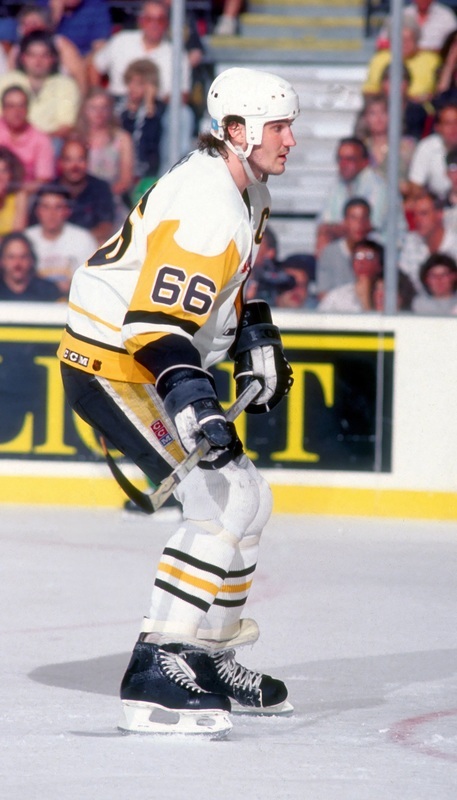 His point scoring streak ended on February 14, 1990 at NY Rangers when he left the game with back pain. 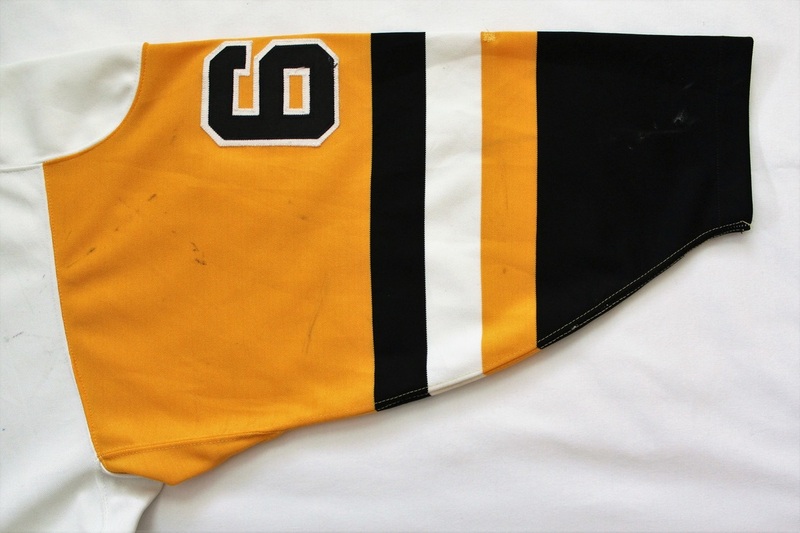 Lemieux returned for the final game of the season vs. Buffalo in which the Penguins had to win or tie to secure a Playoff berth. 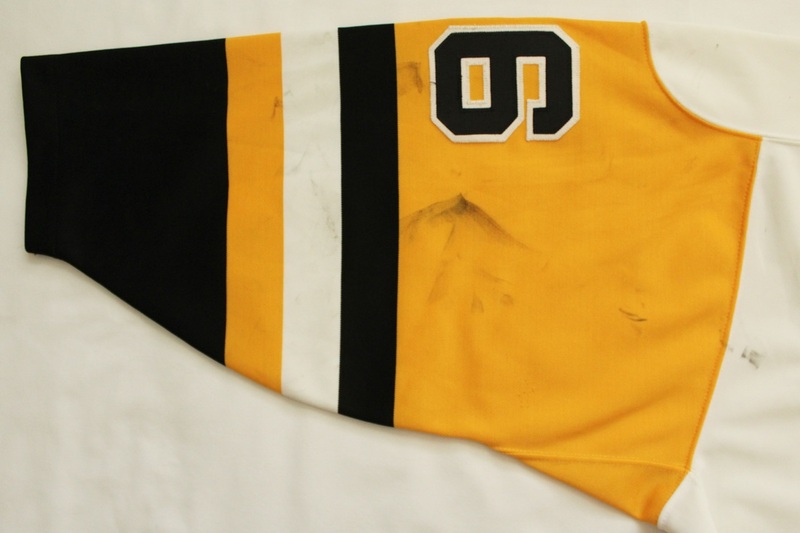 The Sabres scored in overtime to dash Pittsburgh's Stanley Cup hopes despite Lemieux's goal and assist in the game. 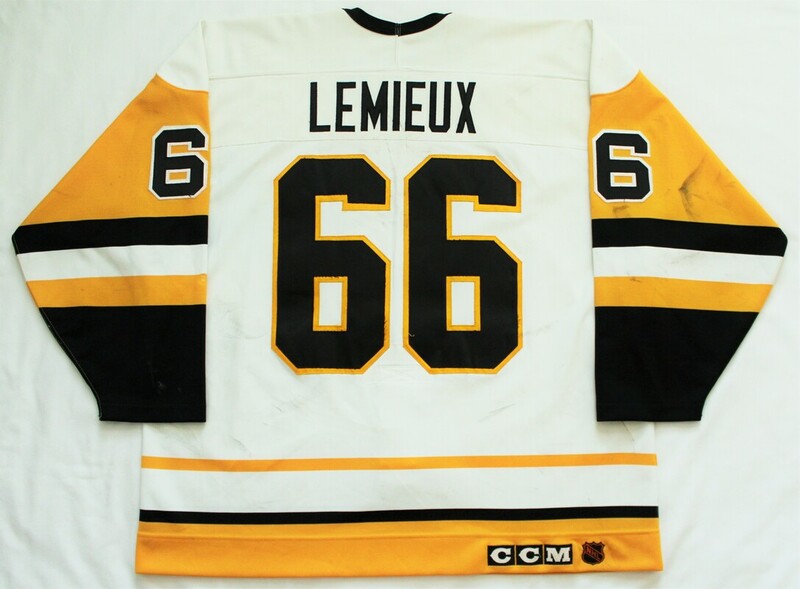 Lemieux returned to the lineup on January 26, 1991 at Quebec with three assists in a 6-5 Penguins win and recorded a point in 16 of his first 17 games of the season and 22 of his total 26 regular season games played. 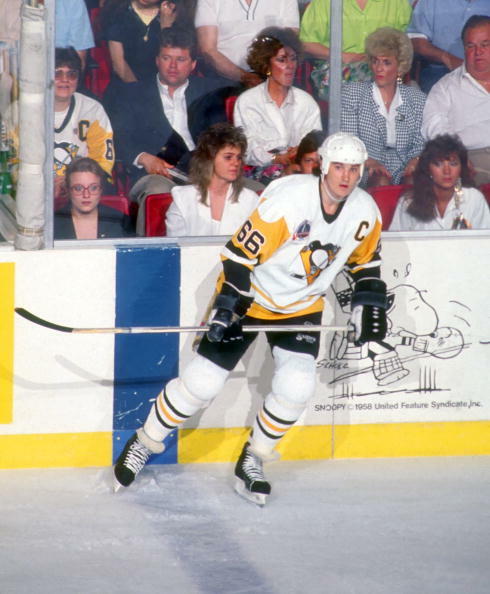 With Lemieux's return, the acquisition of Joe Mullen in the offseason, the acquisition of Larry Murphy in December from Minnesota, and the trade deadline acquisition of Ron Francis and Ulf Samuelsson, the Penguins captured the Patrick Division championship in 1990-91. 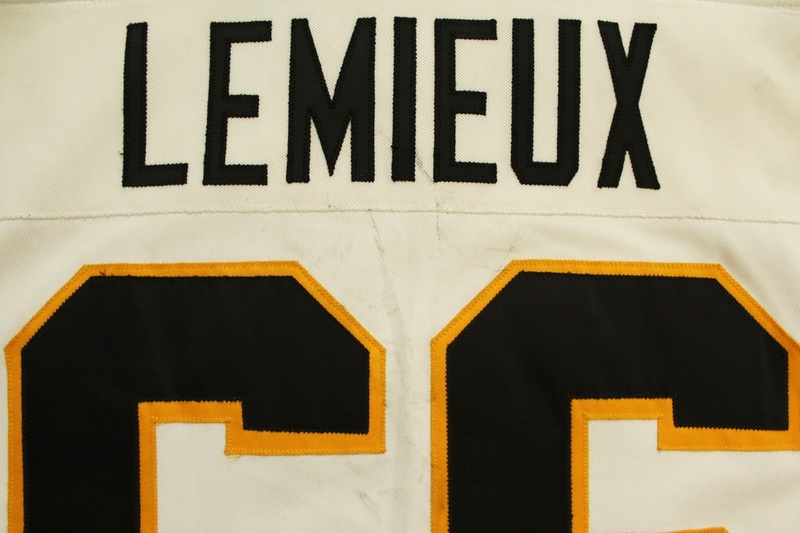 Lemieux recorded 45 points (19 goals and 26 assists) in 26 regular seasons games, a 1.73 points-per-game rate and put him 8th on the team in goals and 7th in points. 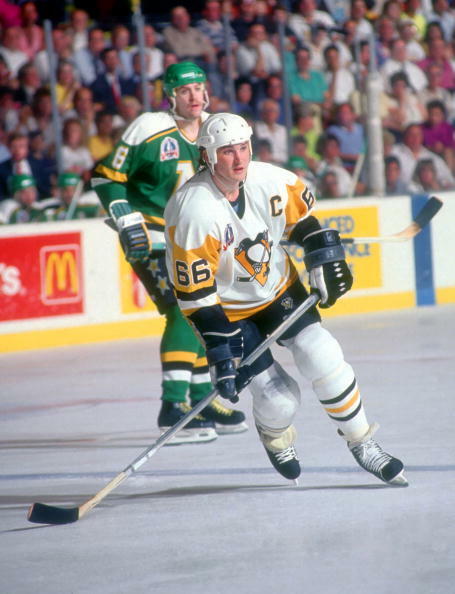 Lemieux recorded at least one point in 17 of 18 games in the first three rounds of the Stanley Cup Playoffs as the Penguins advanced to the first Stanley Cup Final in franchise history to take on the Minnesota North Stars. 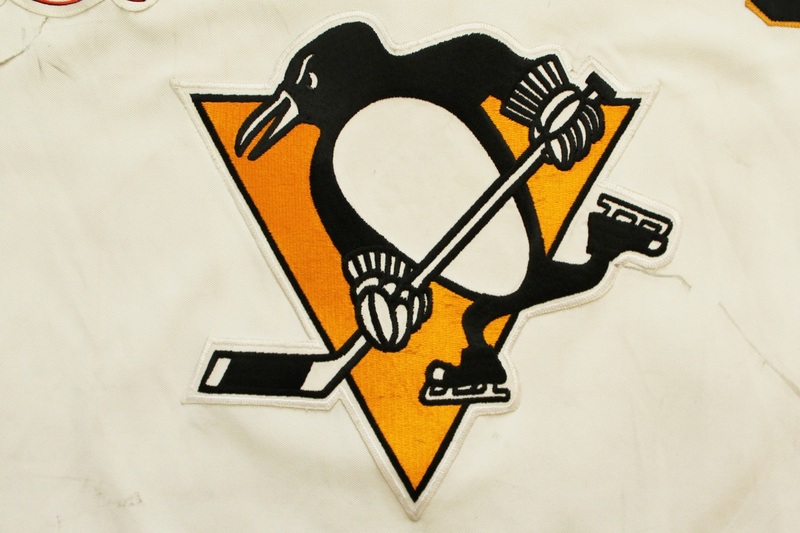 Despite Lemieux's goal in Game 1 of the Final, the Penguins dropped the opener 5-4 and Minnesota gained home ice advantage. 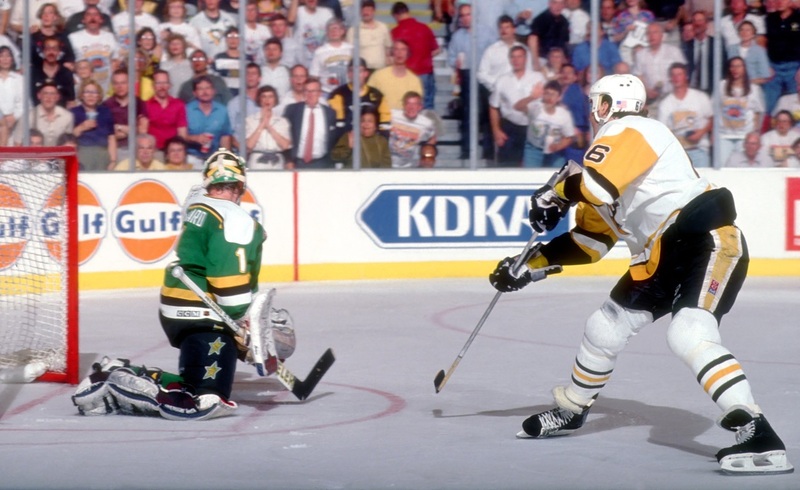 In Game 2, the Penguins held a 2-0 lead after one period before Mike Modano scored 55 seconds into the second period to make it 2-1 and doubt crept back into Pittsburgh's Civic Arena. 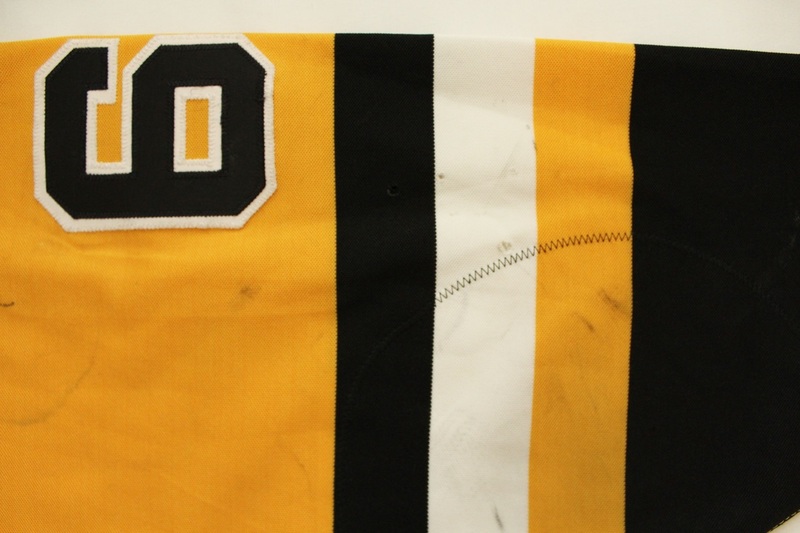 With just over five minutes left in the second period, Tom Barrasso made a great left pad save on a Perry Berezan deflection and Phil Bourque gathered the puck and fired an outlet pass to Lemieux breaking above the right wing circle. 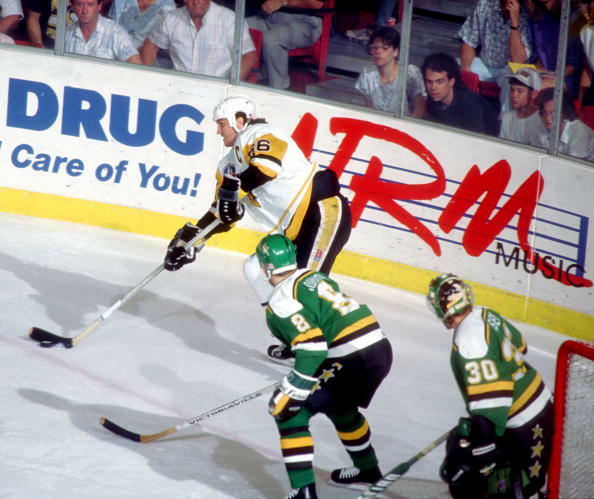 Lemieux looked up only to see North Stars defensemen Shawn Chambers and Neil Wilkinson. 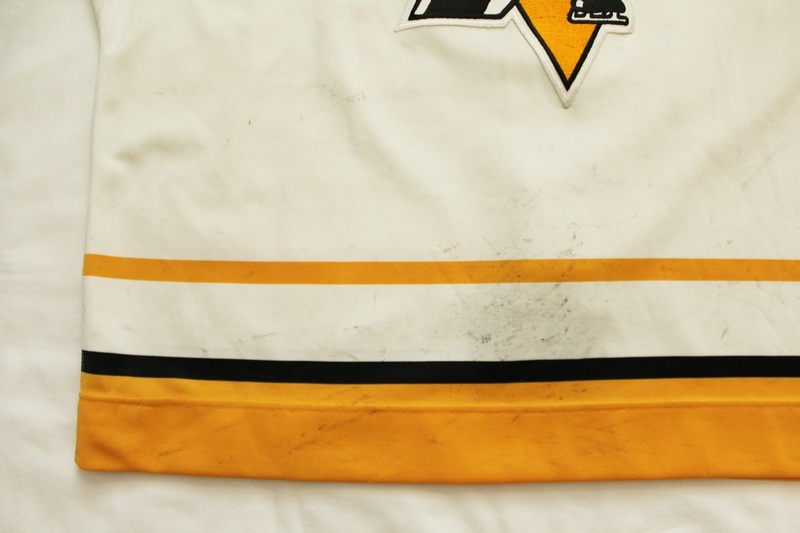 It didn't matter. 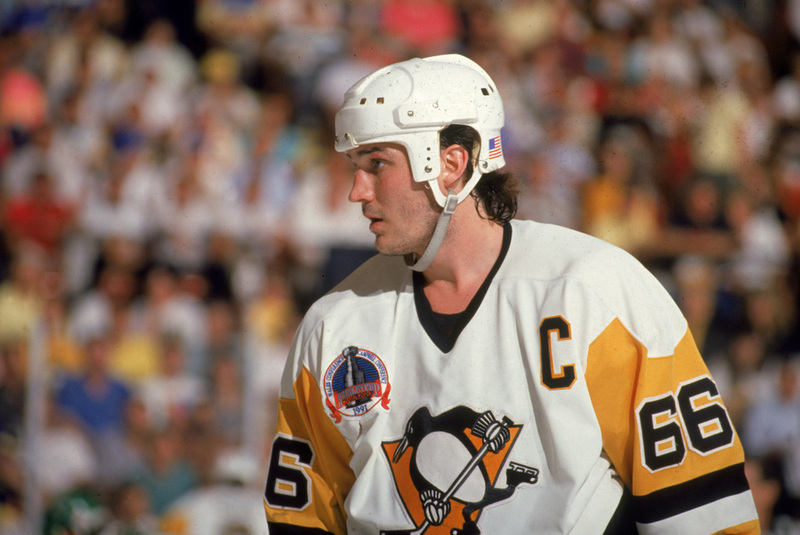 Lemieux was about to do something only he could do. 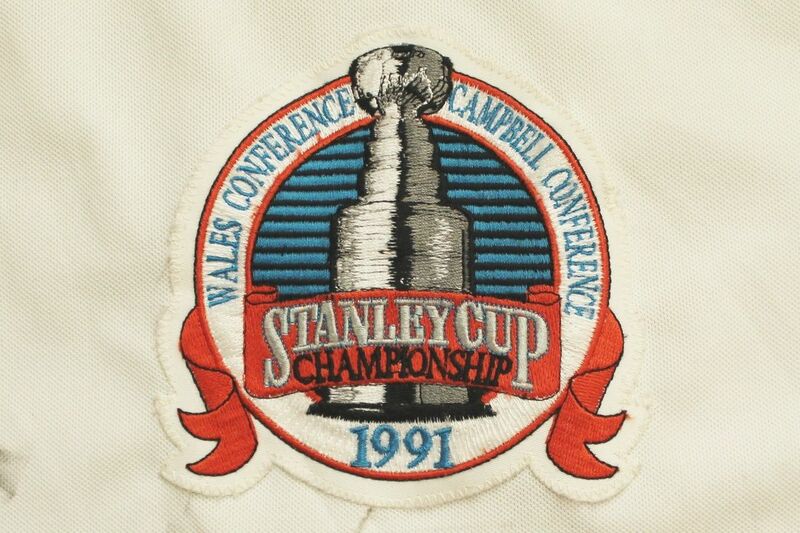 Lemieux raced up the ice and swooped left of Wilkinson and went one-on-one with Chambers. 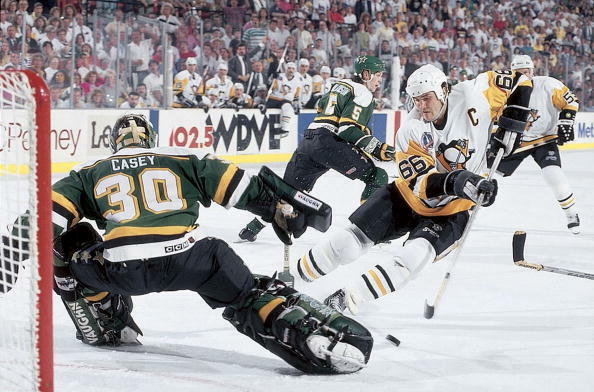 He crossed the blueline and moved the puck to his backhand and then pushed the puck through Chambers' legs to his forehand and was in all alone on Minnesota goaltender Jon Casey. 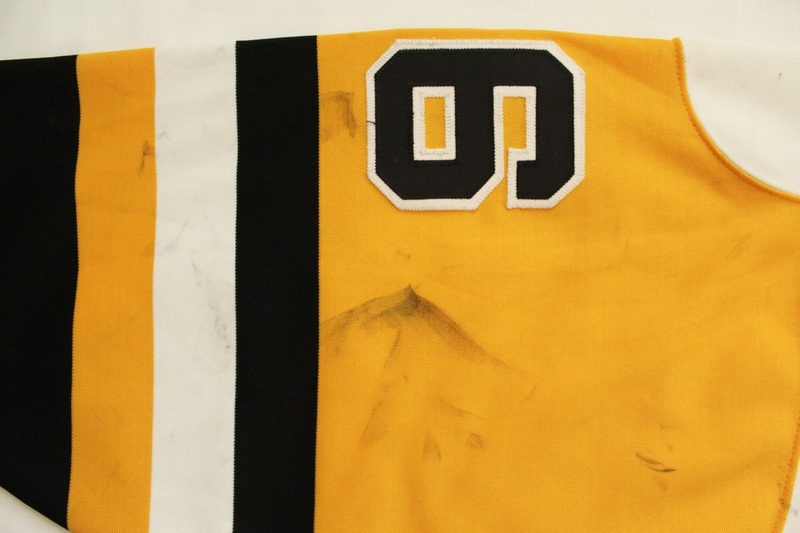 Chambers had fallen to the ice behind Lemieux in a last ditch effort to impede Super Mario. 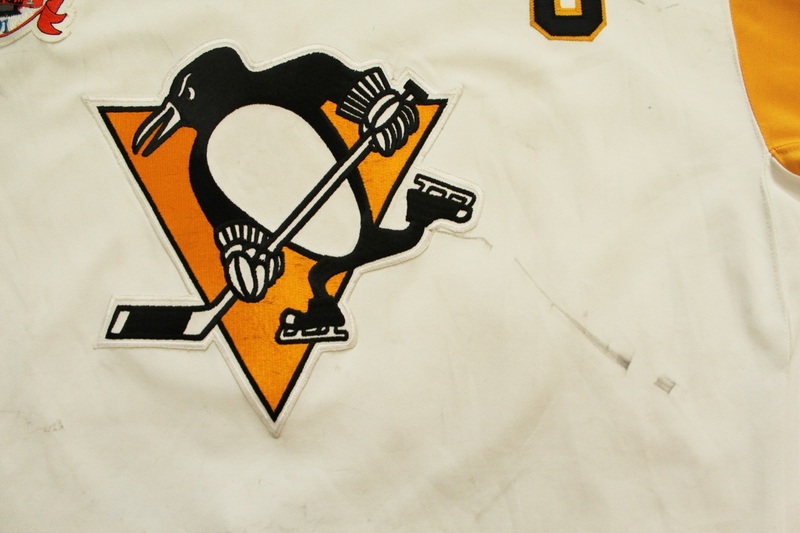 Casey was near the top of his crease and tried to pokecheck the puck off of Lemieux's stick just as Lemieux moved the puck to his backhand and, while falling to the ice, slid the puck into the net to give the Penguins a 3-1 lead and command of the game. 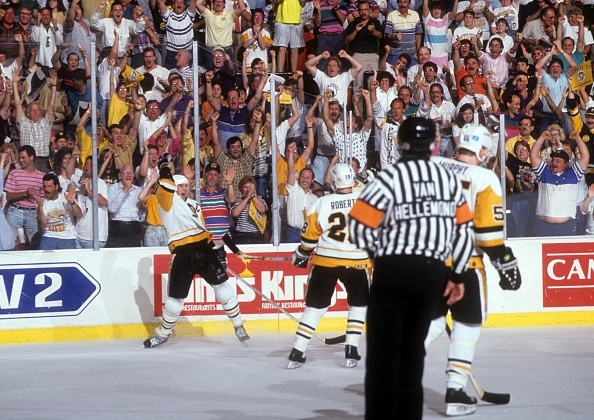 Lemieux, in what may have been his most demonstrative goal celebration ever, skated behind the net and to the boards near the right wing circle and gave a momentous fist pump as he knew the magnitude and magnificence of the goal he had just scored. 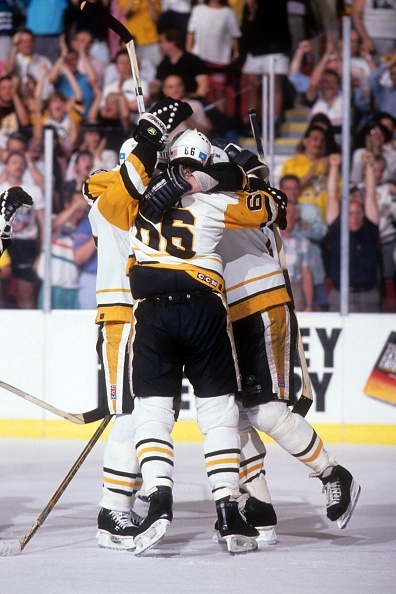 Kevin Stevens added a goal 1:28 later to put the Penguins up 4-1 and the series headed to Minnesota tied 1-1. 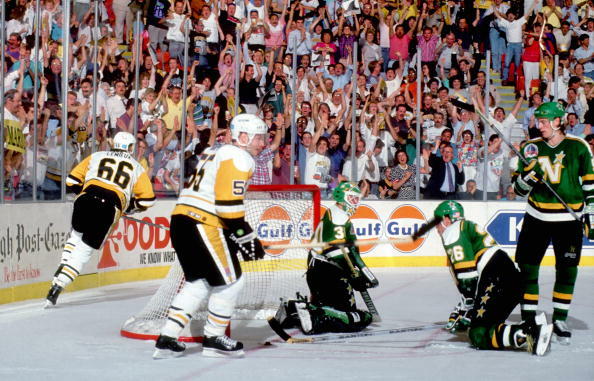 The teams split the two games at the Met Center with the North Stars winning Game 3, 3-1, against a Lemieux-less Pittsburgh team and the Penguins taking Game 4, 5-3. 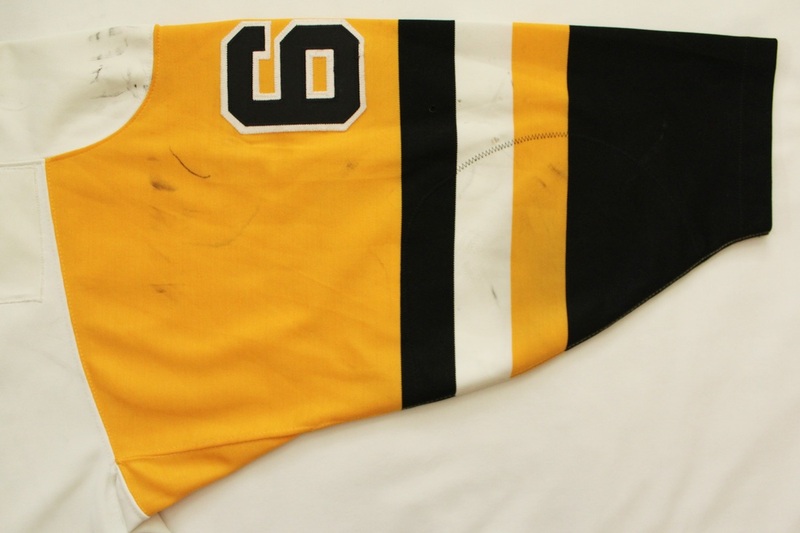 The series shifted back to Pittsburgh for Game 5 where Lemieux scored a goal and two assists in a 6-4 Penguins win. 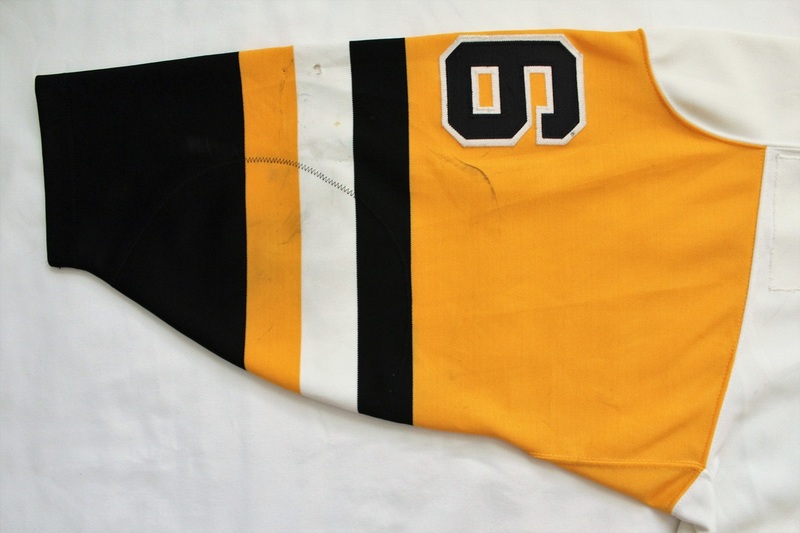 Two nights later, the Penguins thrashed the North Stars 8-0 to win the first Stanley Cup championship in franchise history. 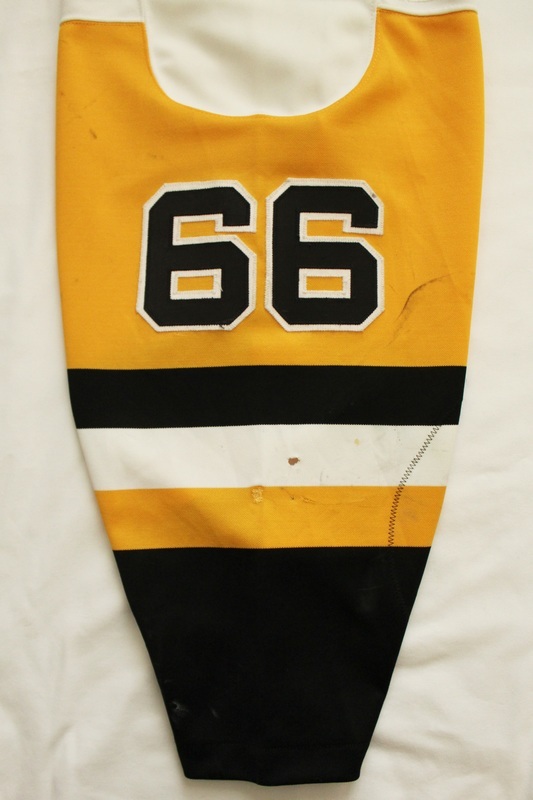 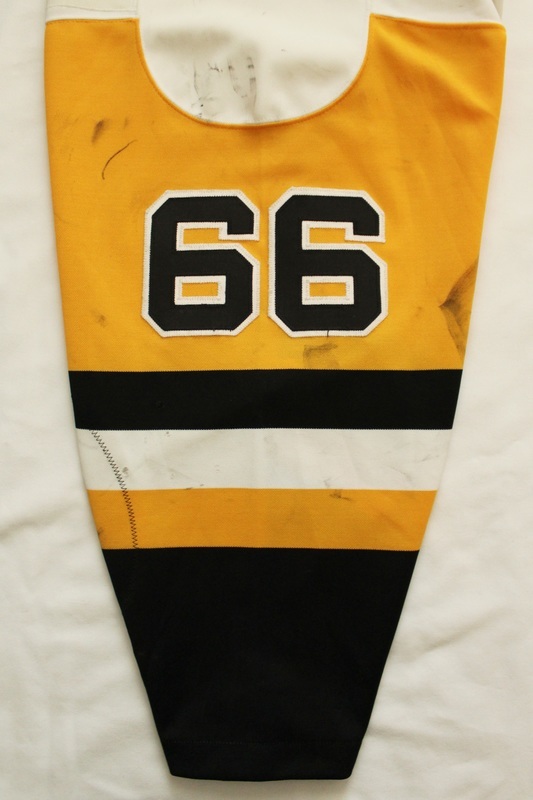 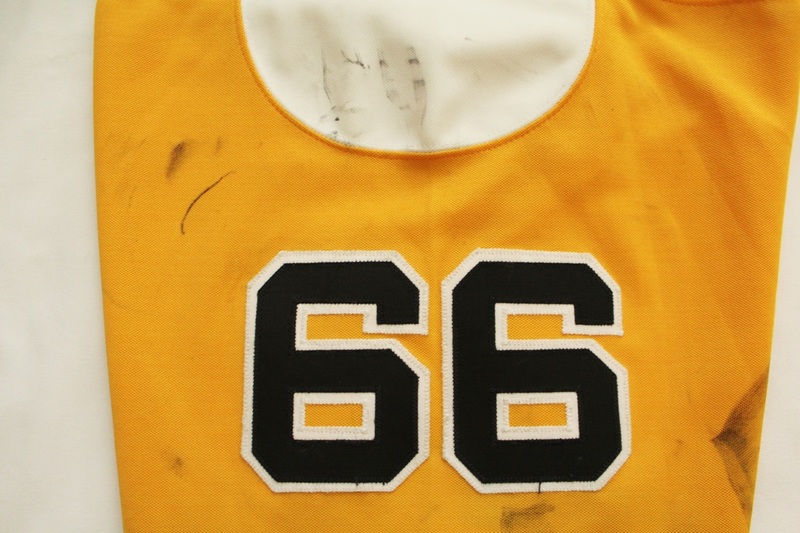 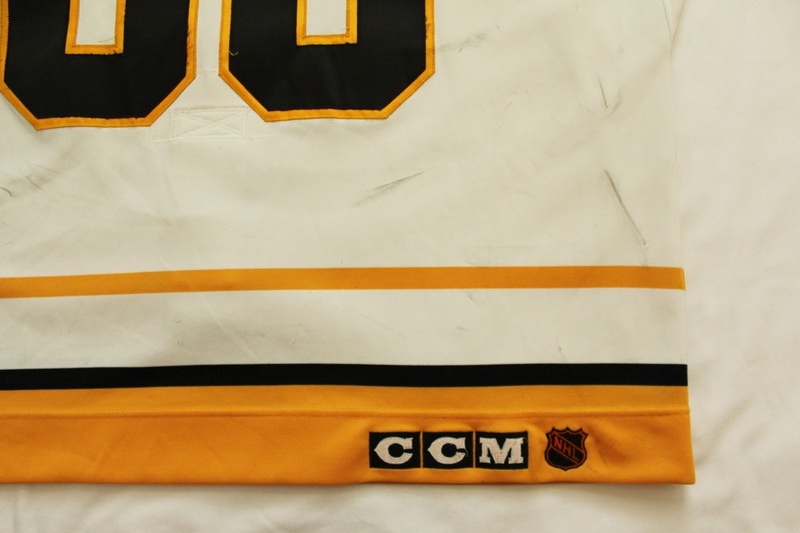 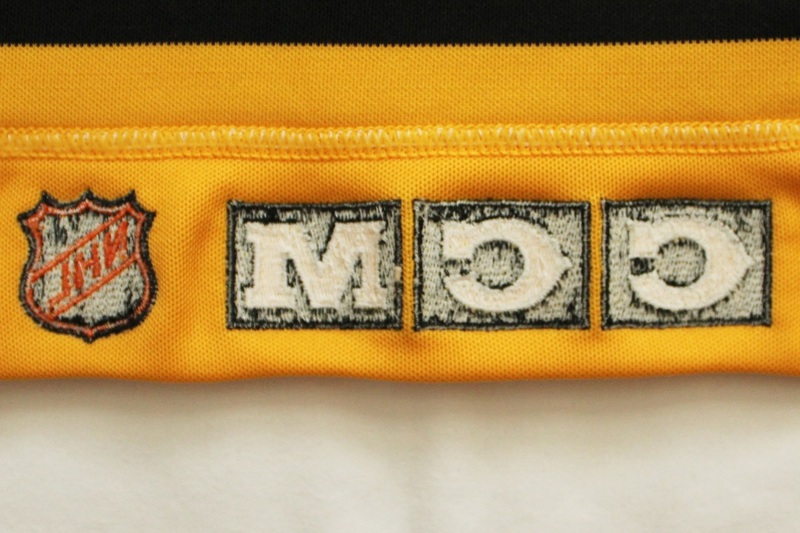 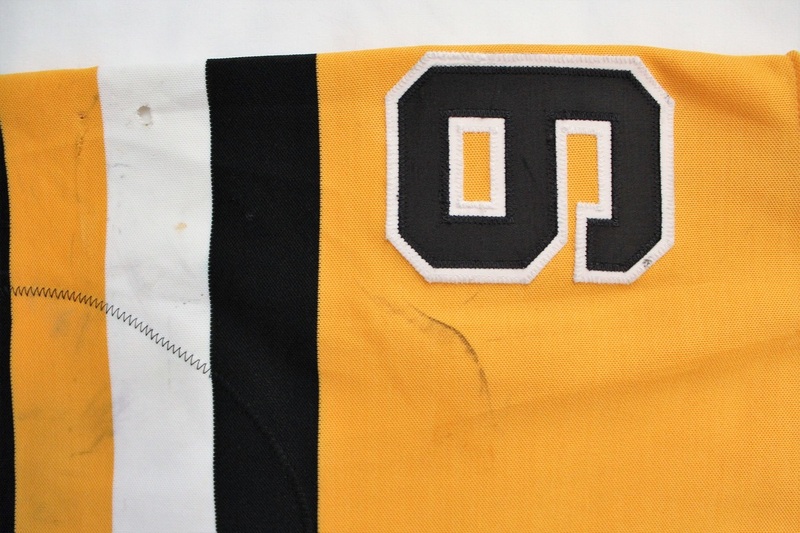 This jersey was worn by Mario Lemieux in Games 1, 2 and 5 of the 1991 Stanley Cup Final in which he scored the greatest goal in Pittsburgh Penguins franchise history in Game 2 which changed the momentum of the series en route to the Penguins winning the Stanley Cup. 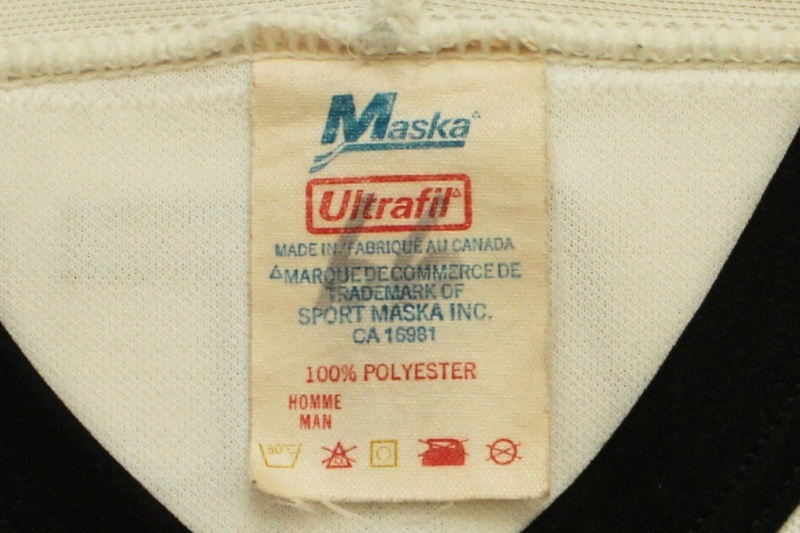 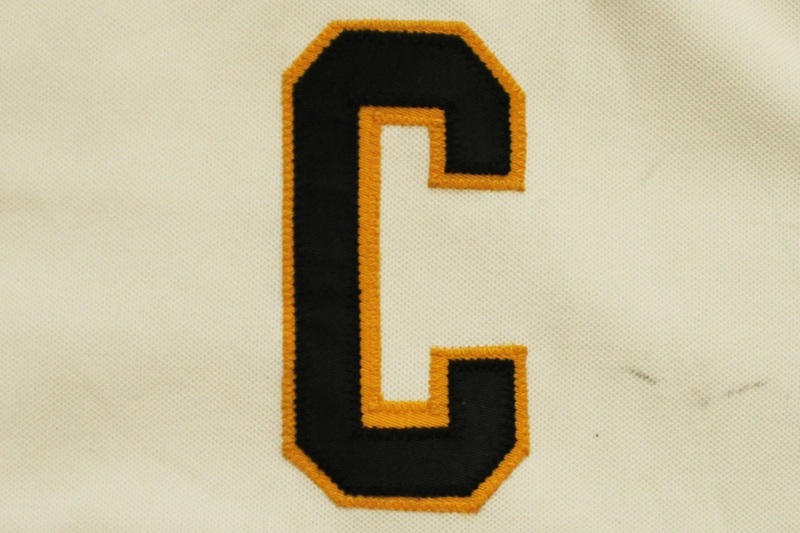 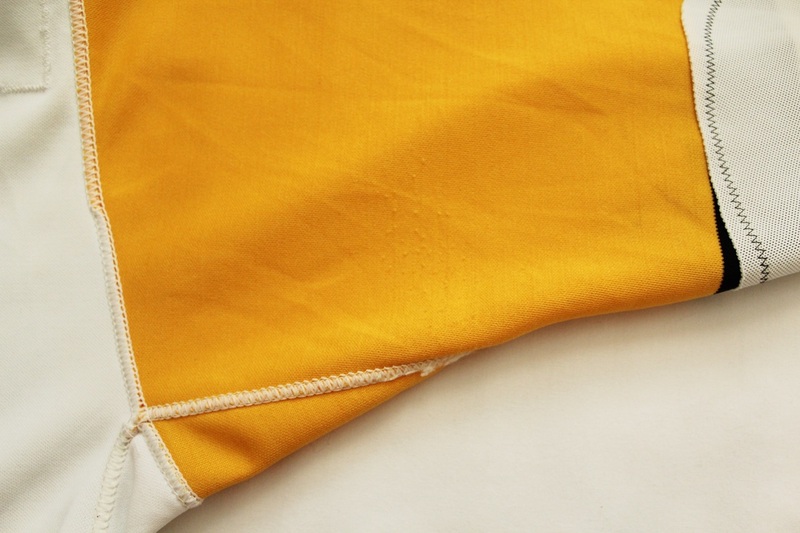 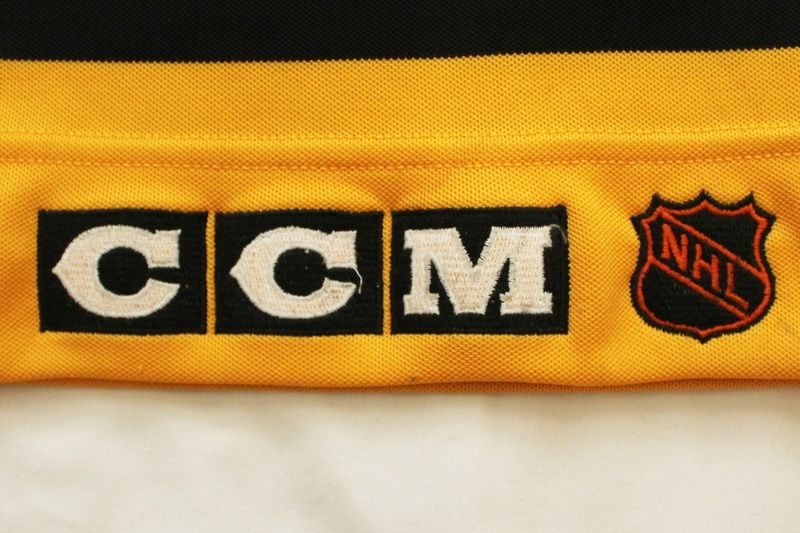 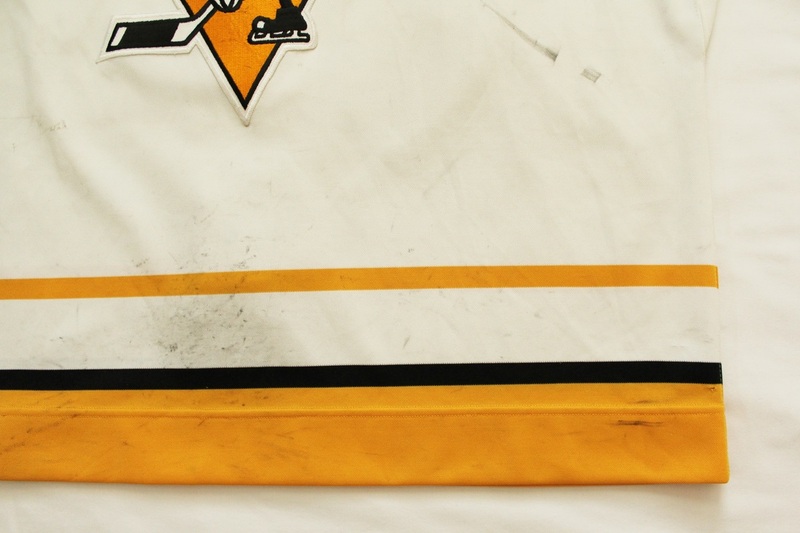 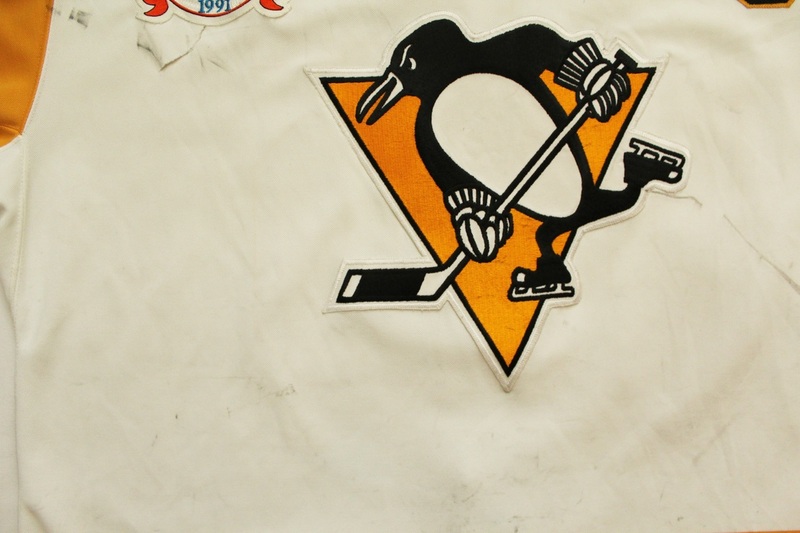 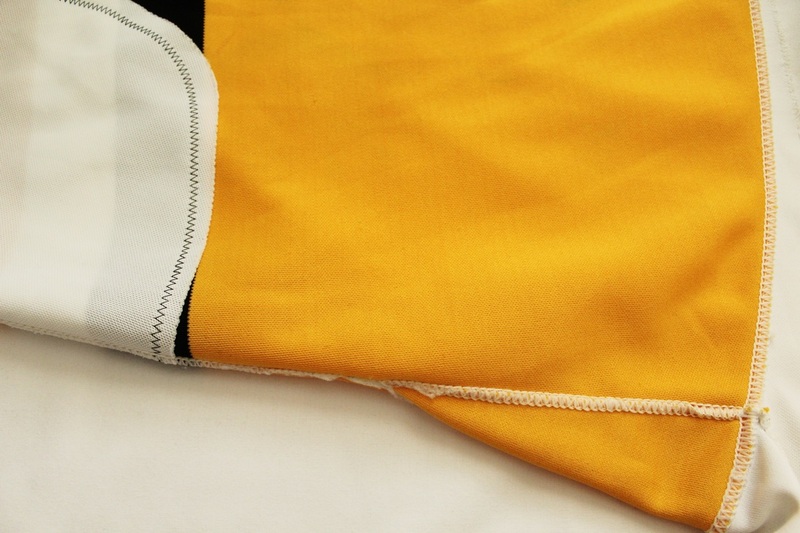 The jersey was acquired by PenguinsChronicles.com from a private collector on in 2006 who originally purchased the jersey from a private source in 2006. 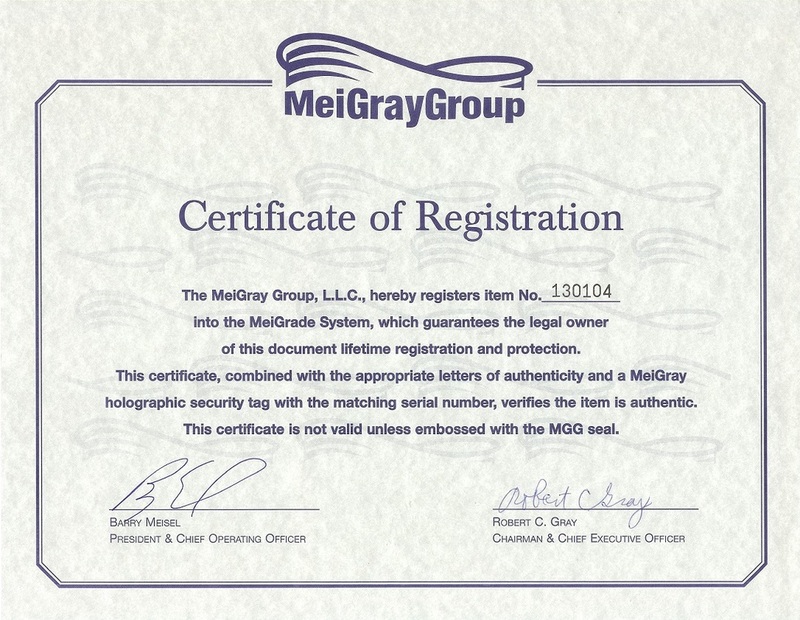 The MeiGray Group, L.L.C., issued a Certificate of Registration into the MeiGrade System as No. 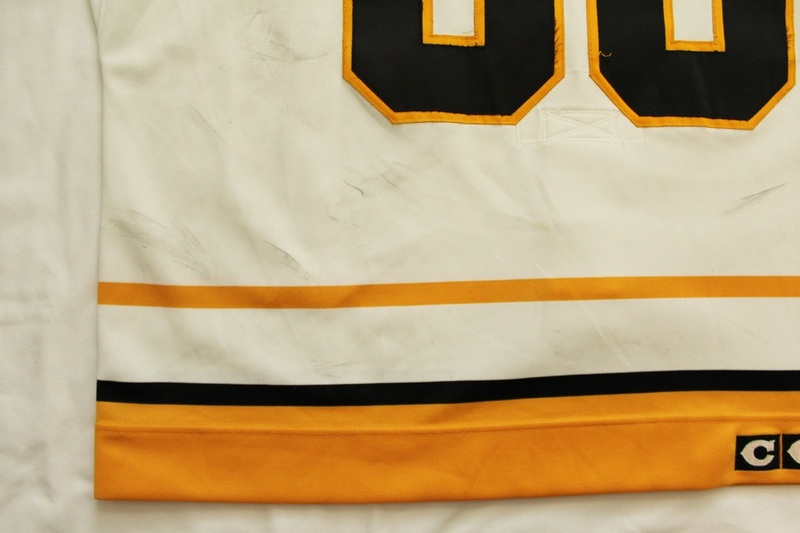 130104.